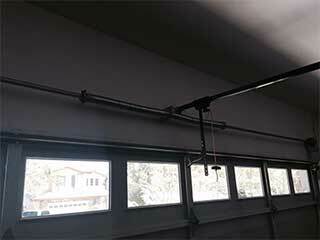 Without springs, no garage door system will be able to function. These hard-working components are vital for the smooth and consistent operation of your door, but no springs live forever. They'll eventually wear out and need to be replaced. A worn and weakened spring can be dangerous, so it’s essential to contact our team if you have any suspicion that yours might be in need of replacement. Are My Springs Wearing Out? A typical torsion or extension spring might last anywhere from 3 to 10 years. It’s very hard to say exactly when, as it's likely to depend on the level of use and maintenance. It’s best to watch out for the warning signs. If you find your door wobbles or sags when it moves, then your springs might be in need of some attention. They might not need immediate replacement - a certain amount of adjustment can be enough to keep your door working safely. To test your spring’s health, open the door halfway and disconnect the opener. The door ought to remain roughly motionless - if it moves up or down, contact our team of technicians for assistance. Springs can be tightened up to a certain extent - it may be possible to adjust the spring tension rather than replace them altogether. If necessary, our technicians will quickly and safely replace your door’s springs. This should only be carried out by our trained professionals, since these high-tension components can easily become dangerous if handled incorrectly. Our team will secure your door into the correct position before carrying out any repairs, and will ensure that the new units are correctly tensioned for optimal performance. Good, regular maintenance can make a world of difference when it comes to the service life of your springs. Our technicians will carefully examine them for signs of damage or corrosion, and ensure they’re kept properly lubricated for smooth and easy movement. This can reduce the likelihood of dangerous accidents and help to extend their working life. Even the smallest sign of a failing spring should ring an alarm bell. If you notice any of the warning signs, or your springs have already failed, get in touch with our team at Garage Door Repair Hastings today to set up an appointment. When Should You Replace Your Door Springs? Need some help installing a new garage door or dealing with an unexpected problem? Let our team help. We got over ten years of experience repairing everything from non-responsive openers and broken cables and springs. Our same day service policy guarantees a fast response and our highly skilled experts can also help you find the perfect type of door or opener for your home. Use our website's booking system to easily schedule an appointment. At Garage Door Repair Hastings we hold your satisfaction above all. Count on our team when it comes to clean and professional work. Our technician will contact you before arriving. Until then, feel free to browse our website! Garage Door Repair Hastings is at your service!